Clicking a bookmark in the Navigator selects that bookmark and brings it into view. Double-clicking it selects the bookmark and brings it into the centre of the view. So, when bookmarks have been used to divide a workspace into sections, they can also be used to navigate between different parts of that workspace. Besides being a way to quickly access bookmarks, this tool can be used as what is known as "Presentation Mode" in FME Workbench. By clicking the + button you flip from bookmark to bookmark, using animation, in a way that would be very useful when showing the workspace as part of a presentation. To access the functionality you need to make sure it is added to the toolbar. You can do this by right-clicking on the toolbar and using the customize option. 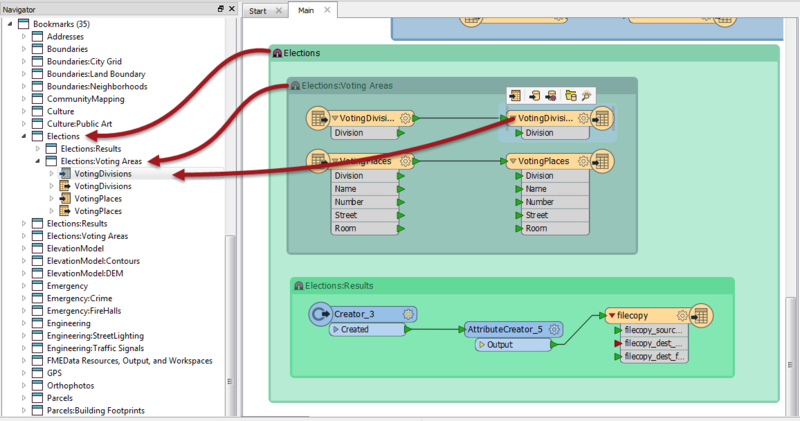 In FME2016.1 the order of the bookmarks in the Bookmark Navigator can be adjusted to give more control over the display order. 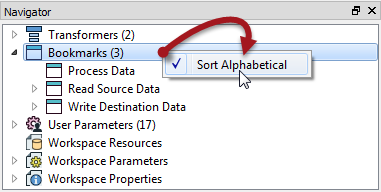 To do so, right-click on Bookmarks in the Navigator window and turn off the default option to "Sort Alphabetically". Bookmarks can then be dragged up and down in the Navigator window to give the correct order. Additionally, a new option on the bookmark Properties dialog allows you to exclude specific bookmarks from the Bookmark Navigator. Nested bookmarks are excluded by default, so must be turned on to be included in the navigator. For more information see the article on bookmarks in 2016.1 on the Safe Software blog.